During the holiday season we try to make sure we serve festive foods, but what about drinks? 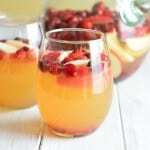 This festive Holiday Apple Sangria is a perfect edition to your holiday or New Year’s celebration. I am not a wine drinker by any means. My husband loves wine. I go for the fruity cheap wines like Arbor Mist (my hubby does not consider this true wine). Sangria, which contains wine, though is definitely something I like. My hubby also approves of it more so than the wines he doesn’t consider true wines. Sangria can be white or red depending on your taste. I tend to gravitate more to the white sangria’s. 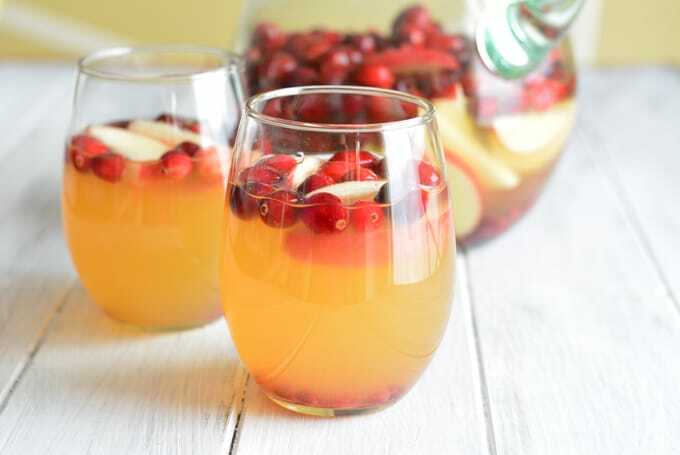 For the holiday’s I love the look of white wine with red fruit. It’s so festive! You can use just about any combination of fruit you want. 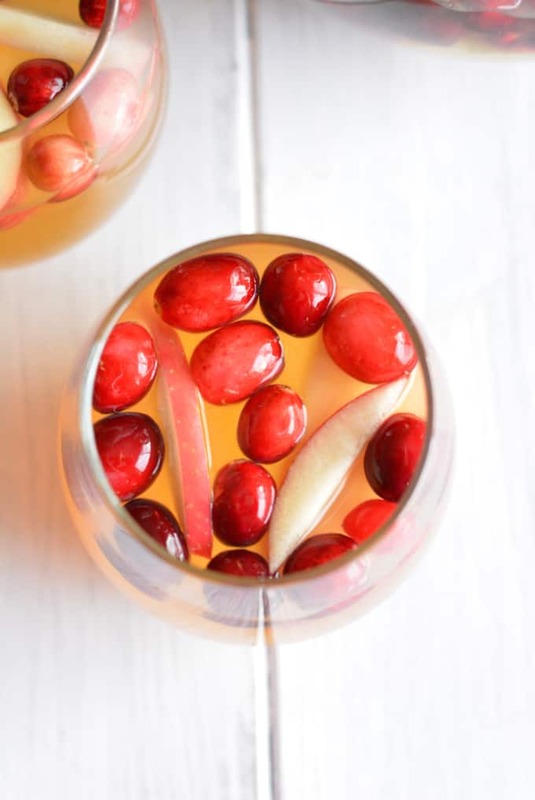 Herbs are often used too in holiday sangria’s to add a touch of green to the color palette. Fruit will naturally sweeten the wine base. I try to use fruit that will not get soft or fall apart after soaking for several hours in wine. 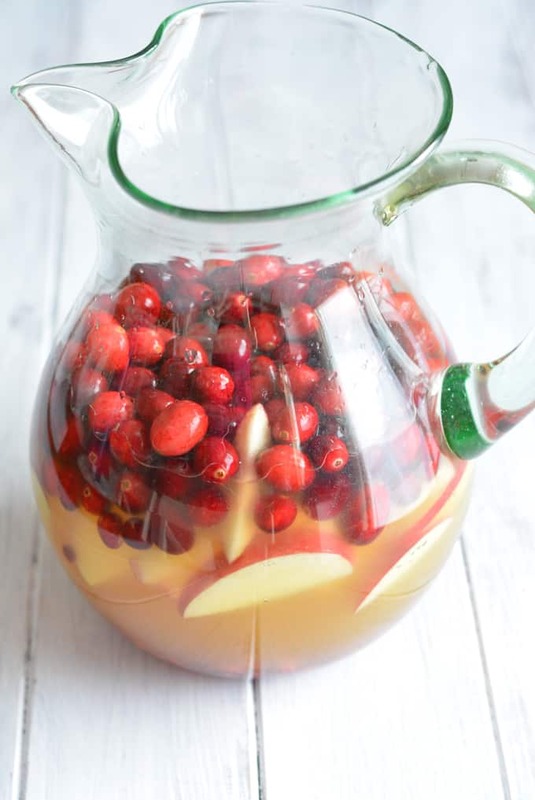 Apples, cranberries, and citrus hold up pretty well. My holiday sangria was consumed before the holiday’s. We spend most of Christmas Eve and Christmas Day out at our relative homes, so I am not home to drink it. It’s also not a good idea to travel with your sangria either! We are just home Christmas morning long enough to open our gifts before we have to rush out. I so wish I could just stay in my PJ’s all day! In a large pitcher combine wine, apple cider, and orange liqueur. Top with apple slices, cranberries, and pomegranate seeds. Add in sparkling cider just before serving. Lovely sangria dear!!! And you all are so cute 😉 Great photo! I wish I could have stayed in my pjs all day too, enjoying some sangria! Sounds like the perfect holiday drink! I can’t wait to try this ones out! What a delicious and festive drink Jennifer! I am a wine drinker like you, the cheap fruity ones! 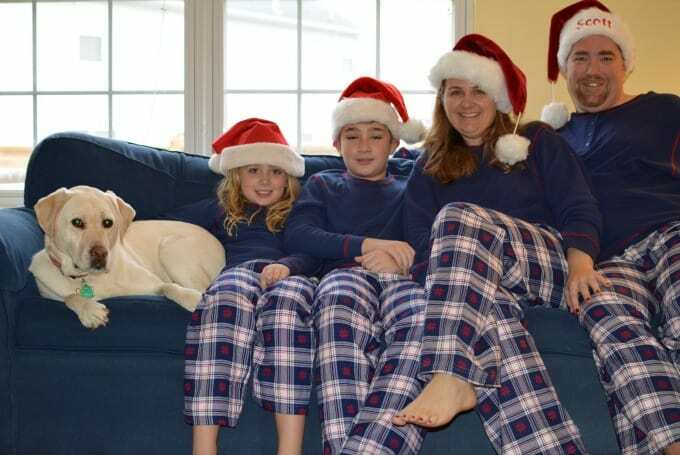 Love your Christmas morning family photo! Cheers to the new year!